Peer Support for first responders has been offered as the frontline service to provide a safety net utilizing all six key components of the ICISF CISM Peer Support Model. 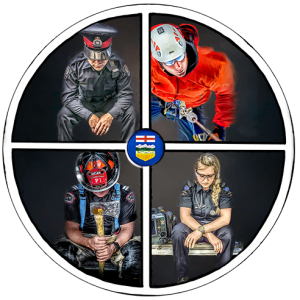 This safety net can improve the system by increasing resistance to the psychological effects of trauma, and resiliency by equipping first responders with the skills to be able to rebound from these effects and return back to adaptive functioning. This means that more first responders will remain healthy, resulting in a reduction of lost time. A case example of an established peer support program demonstrates the cost savings in the first year (SCES, 2017). A peer support program positioned on the full continuum of care, linked to other supports and services, ensures that needs can be met by multiple access points. ICISF CISM is well positioned to complement the other forms of support and can be an effective conduit for facilitating referrals to continued care for some individuals who otherwise would never accept treatment. Peer support can address social isolation and break down stigma that interferes with the recovery process (PSACC, 2016). CISM is a term that refers to a comprehensive, integrative, strategic planning system complete with a multitude of crisis intervention tactics. Such a wide array of crisis interventions provides assurances that the continuum of supports will address and meet the needs of most first responders and limit any “falling through the cracks.” An effective CISM system can be tailored to provide acute crisis intervention with individuals, interventions with small groups of those directly affected, or interventions with large groups of those indirectly affected. 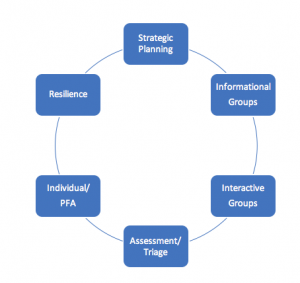 Effective CISM systems require 1) proficiency using various interventions (individual, informational groups, and interactive groups); 2) surveillance, assessment, and triage; And, 3) ongoing strategic planning. In this model, the peers support a person as they search for their inner coping strategies through the use of simple tasks, short contacts, innovative techniques, practical suggestions, comfortable environments, by providing proximal peer-to-peer interactions, immediacy of access to supports, and expectancy of reasonable positive outcomes (Everly, & Mitchell, 2016).